* Sano was vectored from the cover of chapter 127. * Many thanks to kiru-chaaan and tate-sama-senpai for their great help! It's so greaat, the vectoring is excellent. it is a very clean and nice vector, indeed....but I dont know...it just looks rather too flat and out of love from what I'm used to see from you, guess that's a detail that only comes from my mind but bleh. YES! HanaKimi! I thought that guy looked familiar! YEs! This is a sure fave! Awesome vectoring and patterns, and the idea is great! Nicely done! 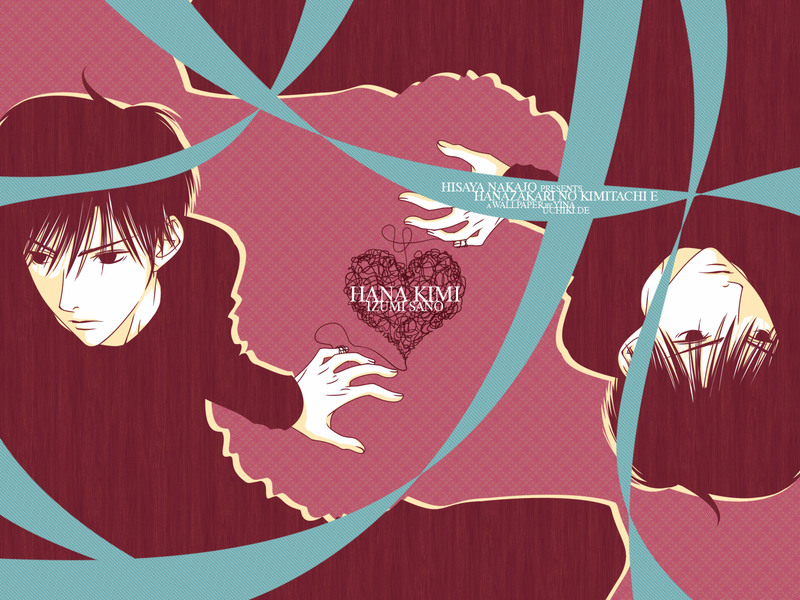 i have just started to read hana kimi manga but i love it already ~ and your wallpaper of sano is really stylish and beautiful ! especially i like the composition of the wall, it's nicely simple but still works creatively that makes it look some how unique ~ the way you have put the same scan on the both sides, up and bottom and the red line coming from the character's finger and making a heart in the middle of the wall is really fascinating and cute detail ^u^ red colours which you have used gives nicely bright and warming feeling for the atmosphere and the blue colour of the ribbon balances the red tones neatly and gives refreshing touch, makes the wallpaper nice to look at. pattern on the background and on the characters gives well liveliness and sense of some kind of surface. the light outlining makes the character stand out well of the background and makes it more clear that sano won't sink into the redness :D overall really clean and neatly vector wallpaper, you have done awesome work as always ~ thank you for sharing !